All our readers know that Recently Tata Docomo launches GPRS plans.It wants to DO something Different again with a name "Do Connect". In the past Airtel is the leading in GPRS plas as it charges Rs.15/- per day with Unlimited usage,When it drops the plan all the Youngsters also leave the Airtel as much. But presently, all the operators are charging as per KB usage,except Aircel. 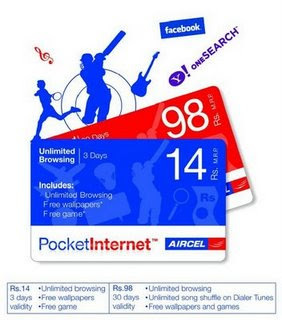 Aircel gives Unlimited Plans at cheaper prices. Now Docomo launches their plans. So now the question comes which is better to take? To solve this question I am writing this small article.I think this may help you in solving the question. From my personal test the Speed of Aircel is Somewhat slow. Docomo [not tested by me] but from opinions is somewhat better than Aircel in Speed factor. Another thing is Cost factor, From the above table I can conclude that Aircel is Good for who downloads most and Docomo is good for surfing the internet and less downloads. I used the Airtel GPRS for long time,though it is unlimited Plan and also Good in Speed we can download and Surf maximum 200MB per day. In this aspect we can choose TaTa Docomo. Anyway, try and feel free to say your opinion, which is better? Can you give configuration settings for each of them?